The Innovation & Collaboration Awards recognize Jewish communal professionals and the organizations they serve. Presented by Spertus Institute's Center for Jewish Leadership. With the goal of encouraging collaboration across the Jewish communal landscape, the Innovation & Collaboration Awards are presented for projects, programs, or services that reach across institutions to serve the greater Chicago Jewish community. The application deadline is past for this year. Awards will be presented at Jewish Community Networking Night on April 2, 2019. Winning projects will be featured in publicity and media materials. sponsorship of the Innovation & Collaboration Awards. 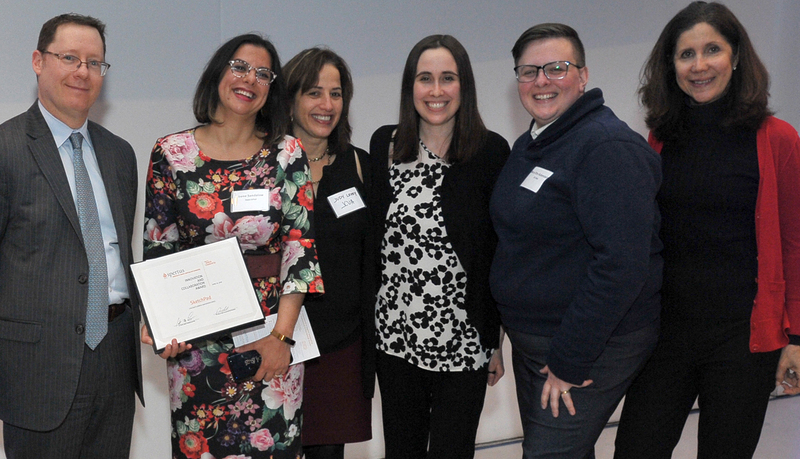 Spertus President and CEO Dr. Dean Phillip Bell with 2018 award recipients SketchPad Director Irene Lehrer Sandalow, JCUA Director Judy Levey, Lani Hart of Giving Tree, ELI Talks Director Mary Otts-Rubinstein, and Susan Horowitz of Mishkan Chicago.